When it comes to powerful, multi-needle embroidery machines, Brother™ sets the standard with the Entrepreneur® PR670C advanced 6-needle home embroidery machine, the next generation of state-of-the-art multi-needle embroidery. Boasting an array of new and standard features and functions that make it the first word in multi-needle embroidery for profit-minded professionals and passionate hobbyists alike, the PR670C offers everything you need to take your embroidery projects to the next level. 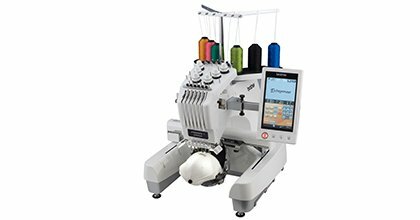 The PR670C combines easy-to-use features with innovative technology to deliver an affordable yet feature-packed multi-needle machine for embroidery enthusiasts and budding entrepreneurs. Maximum Embroidery Area (X x Y) 12" x 8"